Collagen is one of the most talked about beauty ingredients. It’s popping up in everything from face creams to supplements, and is one element that is fueling the bone broth craze. But what exactly is collagen, and what does it do? Collagen is the most abundant protein in the body. Think of it as the scaffolding that holds up skin, muscles, bones and ligaments. Thanks to collagen, nails and hair are healthy, shiny and strong. Collagen in cartilage enables us to bend and stretch our bodies without feeling bones grind against each other. When it comes to the skin, collagen is found deep in the dermis and makes up about 70-80% of it. It’s what gives skin that plump, firm and youthful look. Collagen gives skin its “bounce back” quality and contributes to the skin’s ability to retain moisture. Another way to think of the effects of collagen is the difference between a plump, juicy baby cheek and the flat, papery cheek of an elderly person. The body produces collagen and when everything works smoothly, fibroblasts (or cellular collagen-making machines) create new collagen while the body’s enzymes break down old or damaged collagen and carry it away. But as we age, collagen production naturally slow down which leads to wrinkles on the eyes and forehead, and flatter looking skin. Some estimates indicate that skin loses 1 percent of its collagen every year starting in the mid-thirties. Without the support structure of collagen, fine lines and wrinkles on the face and eyes begin to show up. The connective tissue between skin becomes thinner and the layer of fat underneath it becomes more visible, leading to cellulite. Collagen also plays a role in the repair of skin, as it helps to replace and restore dead skin cells. Collagen patches, derived from animals, are often used to treat burns and work by attracting new skin cells to the wound site. They also promote healing by creating a scaffolding for new tissue growth. But aging is one factor contributing to collagen loss. The sun, smoking, diet and environmental damage can also accelerate this process. But there are things you can do to protect the collagen you already have, and encourage the body to produce more of it. One of the most important steps is to apply sunscreen with a high SPF every single day. Another option is to consume collagen which brings us to bone broth. Bone broth is essentially stock created from boiling chicken, beef or veal bones for a prolonged period of time. Boiling the bones helps extract collagen from the bone marrow- this what makes the broth viscous. Or when you chill it in the refrigerator, the collagen will congeal into a Jello-like texture. You can’t overcook a bone broth as the point is to break down all of the cartilage until a collagen-rich gelatin forms. Eating high protein foods, such as egg, fish and beans, is thought to help give the body a boost in collagen production and some studies suggest that boosting Vitamin C intake also helps collagen production. Another way to boost collagen production is with the right beauty product. 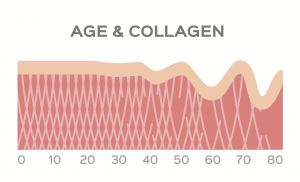 Collagen creams fall into two categories. There are products which contain collagen, and others which help boost collagen production. One of the best collagen boosting ingredients is the vitamin A derivative retinol. It works in two ways. It prevents the breakdown of collagen after UV exposure (known as collagenase) but also increases the amount of collagen produced by “turning on” genes and cells involved in collagen production. Vitamin A isn’t the only collagen friendly ingredient. Reach for antioxidant rich formulas containing vitamins C, E, and powerhouses such as green tea and pomegranate. They work by blocking the damage caused by free radicals, which attack collagen and elastin. They protect existing collagen while also protecting it. Ingredients such as peptides and growth factors also help stimulate collagen production- they basically act as “messengers” to signal cells to start creating collagen. Peptides and growth factors are less irritating than retinols but results can take longer to show up. Here’s a look at some of the best collagen boosting creams. Formulyst’s Pro-Collagen Serum contains a potent mix of peptides and proteins, derived from natural ingredients such as seaweed, wheat and soy. Gently pat a few drops of this hydrating serum on the face to help to minimize the appearance of fine lines and wrinkles. To tackle the signs of aging, apply Formulyst’s Ultimate Youth Concentrate. This silky serum is bio-engineered from plant stem cells and loaded with a concentrated combination of five peptides. The deeply hydrating formula helps soften and smooth skin, and minimizes the appearance of fine lines and wrinkles. There is no one single, magic bullet ingredient when it comes to anti-aging. The best line of defense is a combination of the right products and ingredients, and using them consistently. 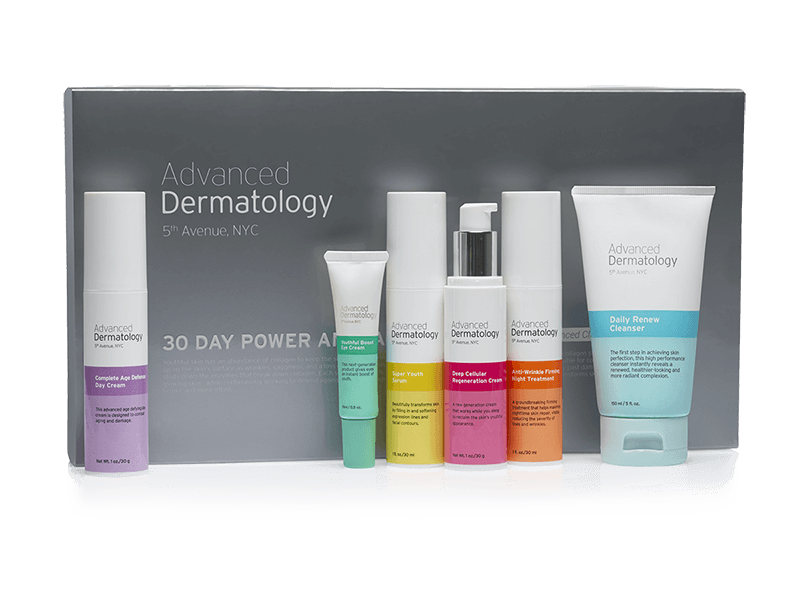 Take the guess work out of choosing the correct products for your skin type and concerns with Advanced Dermatology’s skincare regimen. The line focuses on anti-aging, and contains six products designed to moisturize, protect and boost the skin’s appearance. The regimen includes a Daily Renew Cleanser, Super Youth Serum, Anti Wrinkle Firming Night Treatment, Deep Cellular Regeneration Cream, Complete Age Defense Day Cream and Youthful Boost Eye Cream. This lightweight but ultra hydrating gel-cream formula helps fight the signs of aging while also firming up the skin. Powerhouse ingredients include the Mediterranean brown algae padina pavonica, as well as the antioxidants rose and mimosa absolutes as well as gingko biloba to fight damaging free radicals. Elemis Pro-Collagen Marine Cream should be applied in the morning. Olay’s Regenerist cream does a little bit of everything. It’s powered by peptides to help boost collagen production, while the antioxidants vitamin E and green-tea extract helps protect the skin against damaging free radicals. The formula feels rich and thick, and leaves skin deeply moisturized thanks to hyaluronic acid. Carob fruit extract works to improve skin texture. This fast-absorbing moisturizer turbo charges the skin’s natural rejuvenation process while leaving the face feeling plump and smooth. The cream is loaded with good-for-you skincare ingredients including collagen and hyaluronic acid to fill fine lines and wrinkles, giving skin a fuller look. A combo of niacin, peptides, and ceramides work to improve skin texture and boost firmness. The cream can be applied morning and night. Murad’s Rapid Collagen is a targeted anti-aging serum. It taps into the power of collagen amino acids to target the signs of aging, such as wrinkles and dull skin. A boost of moisture helps to plump up the skin and fill in fine lines. The hero ingredient is winged kelp, an edible brown algae packed with antioxidants to help protect the skin from environmental damages. Olive oil and lavender oil work to soothe and hydrate the skin. Nutrient-rich algae is at the core of Alegenist’s line of products. The brand’s proprietary ingredient is alguronic acid, which is derived from algae and is hailed to have anti-ageing properties. Alguronic acid is thought to encourage cell turnover, while also boosting the power of ingredients such as vitamin C, retinol, and peptides, along with fighting damage from free radicals. Algenist’s line includes Genius Liquid Collagen, a blend of plant collagen and microalgae oil beads, as well as Anti-Aging Vitamin C+ Serum. To boost hydration and tackle fine lines, slather on a layer of Dr Spiller Hydro Collagen Cream in the morning. The rich formula contains soluble collagen, a humectant, as well as bees wax, which works to soften the skin and improve its texture. Both ingredients work together as powerful antioxidants. The cream works to firm and lift the skin, leaving it looking soft and radiant, and creates a smooth base for applying makeup. Collagen Rehab from Bioelements does double duty- this mask can be used on the face and the lips. It is packed with five plant collagen amino acids (including carrot, quinoa and red ginseng) while skin is left soft and nourished thanks to jojoba oil and mango seed oil. The super hydrating formula helps to leave skin looking dewy and firmer. It can be applied to the lips for an overnight treatment. Dry, dull skin is no match for this hydrating facial serum. Kiehl’s Hydro-Plumping re-Texturizing Serum contains 15% plant-based glycerin derived from coconut, rapeseed and palm fruit as well as shiso leaf extract. The serum is designed to smooth away the appearance of fine lines by plumping them up with a blast of moisture. The serum also works to improve skin texture. Think of this serum as an all-arounder. Dr Roebuck’s Perky Collagen Boosting Serum is a plant based product formulated to help boost collagen while also leaving skin looking brighter and tighter. Heavy lifting ingredients include squalene, ginseng and hyaluronic acid, which can hold up to 1,000 times its weight in water. The formula is vegan and silicone free. I see everyone who has written in so far is interested in looking younger. This is not what I am investigating collagen creams for. I used to have naturally long, beautiful nails that many people thought were fake. After menopause, my nails seemed to get thinner and started to get vertical ridges which started to break my nail upward toward the quick. Now all of my nails are doing this and they have broken so far up that I have split ridges in my quick. I need to stop these ridges because this is very painful and it’s hard to use my hands for daily chores. Can a collagen cream build up my cuticles and nails so that the ridges will go away or diminish??? Please help! Can you confirm which collagen cream you are recommending please. Wrinkles are not inevitable. I am 67 and do not have one wrinkle on my face. I have never laid in the sun. I do get injections of natural hyularonic acid for slight sagging of the apostrophe’s and jowl. But sagging and wrinkles are totally different. You can keep wrinkles away with good skin care and stay out of the sun. What works is perscription retin A, glycolic acid, dmae, hyularonic acid, peptides. There is also a new one out now that has promise on actual sagging. If you keep the wrinkles away you can get the hyularonic acid put back in to take care of any slight sag you might get. I use a product called Pevonic Age-Defying Marine Collagen Cream. You can only buy it from spas. Appears to work well. It feels very luxurious and smells great. I have used it for years since the range is stocked at my local spa. What is the best collagen cream for face? I tried lemis pro collagen marine cream and pro collagen marine cream but did not see a major difference in my skin. I have been looking at collagen cream reviews but they have not been helpful. i rate garnier ultralift as the best collagen cream. it is not natural but it works. as soon as you put it on the face looks much heavier and you look like a chubby person.